The Dark Ranger: Lost in Transition. Ugh... We were in it for a while, folks. Coming back twice to tie it. Then in a matter of seconds, the hurricane had swept our our hope and dreams away and left us stranded atop an 8th seed rooftop, with the waters in the east getting deeper. After getting behind early on a power play goal by Eric Staal off the screen by Cole. It appeared we could be in for a long night. Just as we started to show some signs of life, we got the scare of our life as Ruutu steamrolls Henrik of a little shove from Callahan. I hate to say it, but as the king lay writing in pain, I blurted out a "crap, there goes our season"...Was I the only one? But Henrik showed some resilience and what being a Ranger is all about by sticking it out and playing on, despite looking a little stiff at first. That resilience caught on with the rest of the team and we managed to score as Corey Potters first goal slipped past Cam Ward who found himself momentarily blinded by Sean Avery's agitating backside. In spite of a storm of whistles and penalties called (the first period saw over 5 penalties--the majority in our favor, if you can believe that), there wasn't much by way of scoring as both teams really couldn't capitalize. The rest of the way, it appeared as though our blueshirts were always a step behind Carolina as they scored on a rebound. Catching up again only to allow the Canes 3rd and 4th goal within a matter of seconds of each other as our team pressed but really couldn't put a play together. 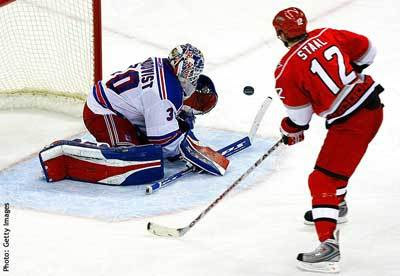 Was Cam Ward really that spectacular? In my opinion, hardly.. but we were beaten to nearly every rebound by the hardworking and high energy Carolina team. We lost this game the same as we lose most games to Carolina or any up tempo team. We get lost in the transition and find ourselves too deep after taking for granted that we'll should be able to gain the zone with no problem. (thats when our most careless turnovers happen) For a team that seemed content to take a pounding from us all night, the Canes still managed to beat us to the rebounds of our shots as they used position and speed to set up odd man rushes and as we scrambled to get catch up on the back check. There were also a number of shots that hit our players in the back as they jockeyed for position in the slot and hoping for some scraps left out by Ward...Mostly ignoring the opportunity to deflect the puck on the way in. We find ourselves in 8th today... as it appears teams all over the east are conspiring against us as every team thats needed to... has gained points on us. 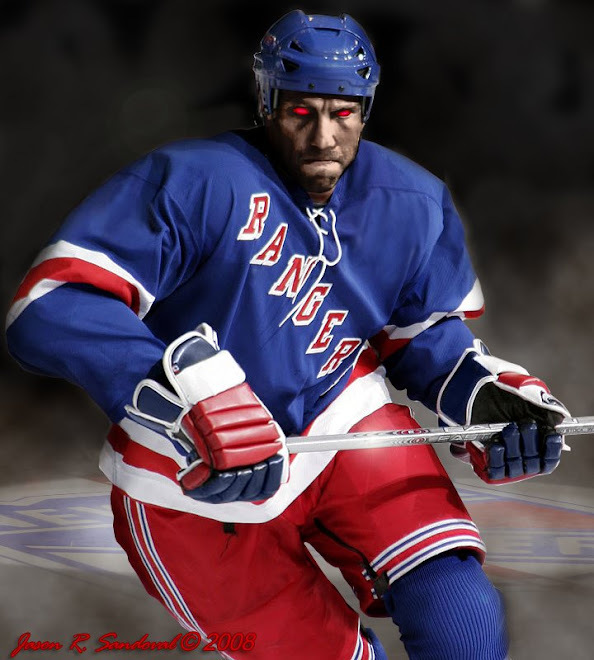 It's just as well, Ranger fans. If this team is to make it anywhere near the big dance, past the first round, past the second (is there such a thing? I've almost forgotten) ... they'll have to learn its all up to them and play every game like they did against NJ. Until they do, the view from our 8th place rooftop is only getting bleaker. Its sink or swim from here out, Ranger fans.